Souvenirs are a matter of taste, so here I list some basic ideas only, and you will find whatever you personally like when you come to Afghanistan. Lapis lazuli is a deep blue stone mined in only two places in the world: Badakhshan in Afghanistan and somewhere in Latin America. You will see things made with it everywhere, mainly jewelry and knives. Or you can buy raw pieces of it; they look nice enough. Silver is quite cheap. Things that are beautiful in the Western sense are few; mostly it is something tribal. Gold is imported from Iran; therefore, it is pointless to buy it here if you then go there. But gold jewelry is stunningly beautiful and costs about 10 dollars per an 18-karat gram. Ancient coins are most likely fake and should be bought for appropriate money — a couple of dollars per piece. Sometimes a shop owner shows one or two coins and swears these ones are real. They can be. People always find real old things in Afghanistan. But you need to be an expert in the matter or ready to lose your money. The asking price is a few dozens of dollars. In Balkh they sell “antique” glassware. Again, it can be old because the ancient city walls are right there, and you can find at least broken ceramic pieces yourself. Again, this is also the motivation for people to produce fake antiques. You need to be able to tell what is what, or do not buy, or risk losing money. Pushtun woolen hats that are so associated with the mujaheds should be cheap because it is an everyday item. A set of male shalwar qamiz costs about five dollars although it is not clear what you will do with it when you come home. A hat you can at least put on a wall. Ahmad Zahir is a national singer who has died in 1977. You simply need to hear him; he is so great even when you do not understand a word. There are his mp3 records in the internet, by the way. You can buy his CDs in Kabul, on Chicken Street. Get a few — if you do not like them, someone at home will. 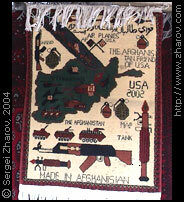 Carpets are what Afghanistan has been famous for. Something is still produced. If you are not an expert in carpets, do not buy — you will get cheated for lots of money. It takes about a year to hand-made a carpet. A shop sells very few each year and will try to make its target numbers in one sale by overcharging you many times. Also, think about how you will transport this carpet to your home. By the way, if you walk on a street and there is a carpet on a sidewalk, keep walking over it. It is a special technology, a part of the production process: a carpet needs to be walked on in dirty shoes, or something like that, so the owners just put it on the sidewalk for everybody to make it better. Spent and live cartridges and the like are everywhere for you to find. Do not overdo it, though. On Chicken Street many antique shops sell old weapons, both steel and firearms, and all of it working. As with carpets, think about how you will transport it through the many remaining customs checks. The best place to buy souvenirs is Ghazni. Jewelry is very cheap there because there are virtually no tourists coming. The worst place is Chicken Street in Kabul. It is almost completely geared towards reaping the foreign morons off.